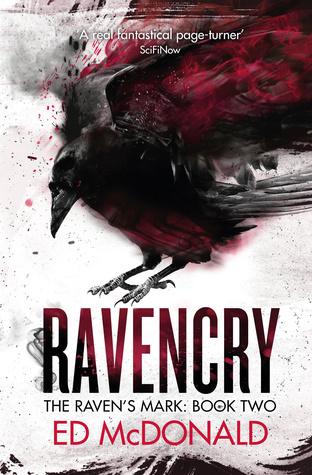 Ravencry is the sequel to Ed McDonald’s absolutely storming debut, Blackwing. Ravencry takes place in the same bleak, hard-edged world as its predecessor, full of uncaring titans, mad magicians and a few people trying to do the right thing. Or at least not do the wrong thing. Most of the time. If the money’s good enough. If you’re here, chances are good you want to know if Ravencry lives up to its legacy – and the short version is yes. It’s brilliant - a tightly written, tautly plotted story of monsters, magic, betrayal and murder, with action that kept me turning pages, and schemes that left me wondering which of the unreliable characters I could trust. A lot of Ravencry occurs in an urban environment, in Valengrad, bastion of all that is morally grey , standing at the border against the creeping horror of the Deep Kings. Valengrad is a pretty terrible place, one with rot sitting at its heart. The city thrums with life like maggots through a corpsecivilians moving between buildings in what seems like constant rain, ruled over by an oligarchy which seems to regard the seething mass of the populace as a mild inconvenience at best, and is outright repulsed by them at worst. It’s a city living in a noir nightmare, where the shadows seem long and constant, and are likely to hide a member of the state security apparatus. It’s a place desperately in need of hope, and fertile ground for something new – a semi-religious cult of the “Bright Lady”, which preaches egalitarianism and social reform, a ray of searing light in a world inclined more toward the darkness. It’s a change, but in a world where everything has a seedy underbelly, onr I forced to wonder whether a city as vibrantly, horrifyingly alive as Valengracan generate something as clean as hope. We also get to see some more of the Misery, the blasted no-mans land between the Deep Kings an our less than polished heroes. It’s a Lovecraftian nightmare of shifting geography and altered perception, a space where the dead walk and talk, where the phantoms of your past are likely to pick up a rock and bash your head in. It’s a twisted, psychedelic place whose haunts are both revelatory and deadly. It has the capacity to break people, and if it doesn’t destroy them, is at least as likely to change them, to move a person closer to themselves, and closer to a monster. Several of the characters sliding between city and Misery will be familiar as well. Galharrow, the gruff, pragmatic and brutal instrument of higher powers is still here. He’s got a shinier belt buckle, after the events of the last book, but is still the same man. That said, he’s now haunted by the spirit of lost love, a man stalking the half-world in search of truth.The man is now more driven, searching for something he feels has been lost. That loss has also informed the character - perhaps because a lost truth is worse than none at allGalharrow is still bitter, though with some of the edge filed off, but instead feels like a man on a quest – a tarnished knight seeking a grail of remembered affection, or at least emotional truth. This is a man being emotionally torn apart before our eyes. The raw passion at the heart of his dysfunction is terrifying in its honesty, and also in its effects. That said, Galharrow is still a man willing to kick arse and take names, or, preferably, shoot someone in the back whilst they’re asleep to solve his problems. gives the character some heart. Then there’s the rest of this found-family; the hyper-organised secretary, whose competence keeps the entire enterprise afloat, and the teenage refugee determined to follow her role model into the Blackwing service. Watching Galharrow struggle with his feelings and approaches for both of these women, both independent, prideful and willing to make their own decisions in spite of him, is a delight. That their ‘family’ is filled out by a semi-psychotic mage trapped in the undying body of a child – well, that’s just par for the course. These are complicated, often broken characters, whose emotional responses are crippled or channelled by traumatic past experience, but also feel genuine, and feel human. They contrast interestingly with the villains, whose competence is matched by an effort at inhumanity which is too malevolent to be uncaring. Those who stand against the Blackwing are skin-crawlingly vile, and I shivered in visceral disgust more than once. The plot pulls from noir - a twisted, byzantine string of plots, counterplots, misdirected truth and outright lies. The central mystery is tightly plotted and compelling, and kept me turning pages far too late into the night. It’s got everything: bizarre magic. Treachery. Misunderstandings. Impressive displays of magic. Brutal murders. Stabbings. This is the bleeding edge of fantasy, one which you’ll feel leave a mark on you as you read it. It’s smart, and it will get under your skin, so that you want to know what happens next, then spend pages with heart in your mouth torn between trying to reach the end and not wanting it to end. I guess that’s a quick way of saying, Ravencry is worth your money. It’s a sterling sequel to Blackwing, one I’ll be thinking about for a long time to come, and one I whole-heartedly recommend.